Our Design to Disrupt research program deals with the forces that are radically reshaping the world of business as we know it. Disruptive innovations are creating new industries and business models and destroying old ones. Many of the roles and job titles of tomorrow will be ones we’ve not even thought of yet. Think of jobs as social media marketeer, data scientist and API manager… These job titles were not existing 10 years ago. New technologies, data analytics opportunities and social networks will continue to change the way we communicate, collaborate and work. 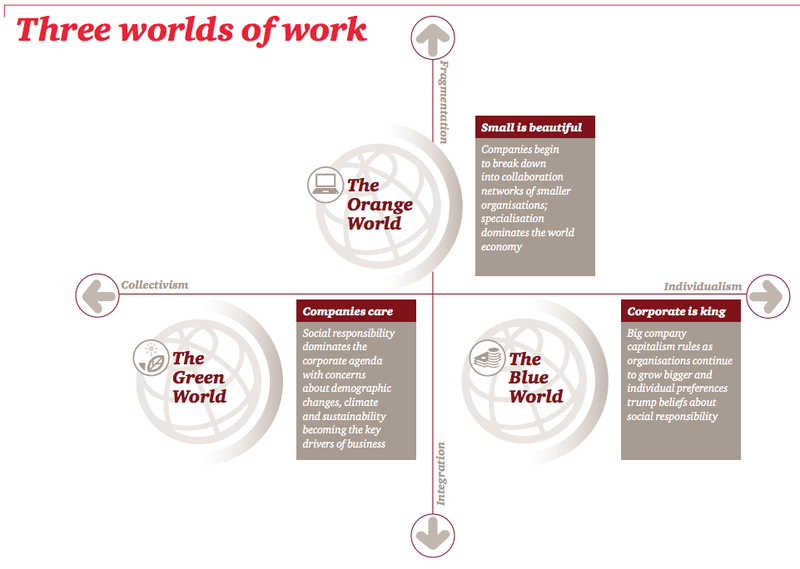 The report presents a ‘three worlds of work’- concept on what types of organizations we will have in the future. This scenario is all about good old “big company capitalism” and the primary goal and purpose of a business is to focus on profits, revenue, and growing market share. 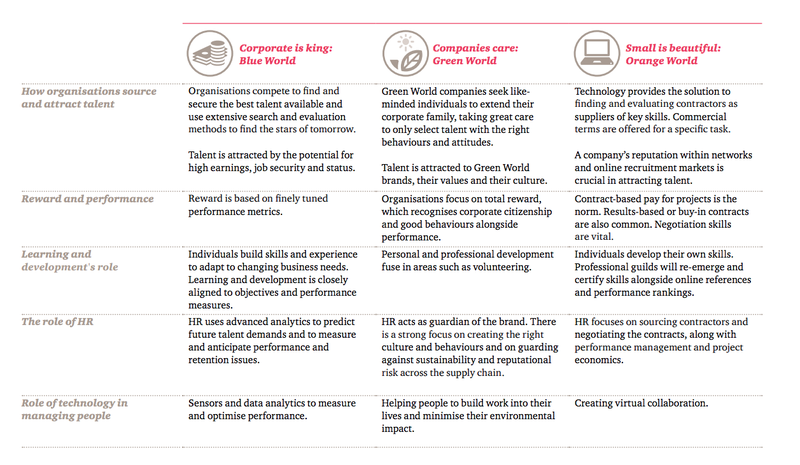 Green represents companies that focus on sustainability, well-being, and eco-living. Employees and customers team up to have a positive social and environmental impact. Co-creation and crowd wisdom are at heart of these organizations. ‘Orange companies’ are quite similar to the startups everybody is talking about these days. Companies that focus on maximizing flexibility while reducing costs. In this scenario freelancers and entrepreneurs dominate the employment landscape and companies break up into smaller entities in order to stay relevant with fast changing world we live and work in. So is your company heading towards a blue, green of orange future? 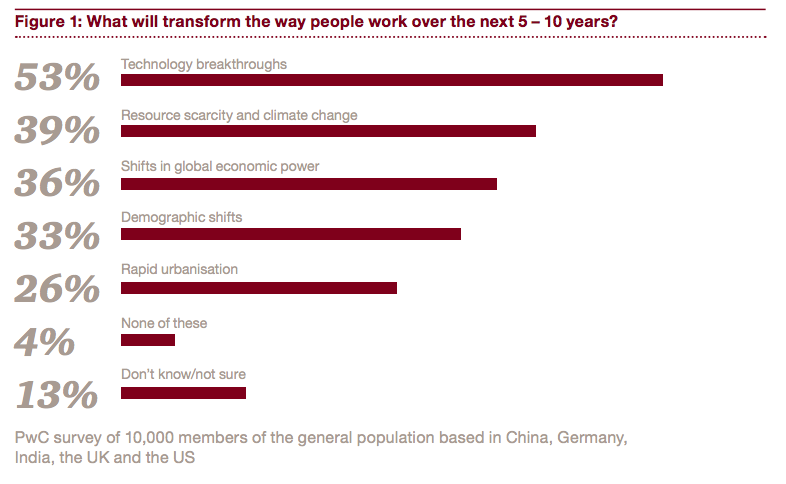 I think the future of work will offer all 3 scenarios. Maybe even within the same company: different divisions that support different goals and strategies. This post was previously published at Sogeti Labs.